I have had a Taste of Home magazine insert for years. It’s the same insert from where I got my pumpkin pancake recipe and pumpkin cake recipe. I make both of those every fall. And I did. :) And a fun, festive meal it was! First you have to partially cook the stew. ** In Dutch oven ( I just used a big pot) brown meat in 2 TBS oil. Add water, potatoes, carrots, green pepper, garlic, onion, salt and pepper. The directions say to cover and simmer for 2 hours, but that was way too long in my opinion—maybe an hour would be sufficient. Stir in bouillon and tomatoes. While the stew is simmering, you will need to wash pumpkin then cut a 6 to 8 in. circle around the stem. Remove top and set aside. Remove seeds and loose fibers. Place pumpkin in a shallow, sturdy baking pan. Spoon stew into pumpkin and replace top. Brush outside of pumpkin with remaining oil. Bake at 325 degrees for 2 hours or just until the pumpkin is tender. ( Do not over bake) Serve stew straight from the pumpkin, and if you like, scoop out a little of the pumpkin with each serving. All done! My pumpkin was a smidge too big, but it still worked. Most stews have a long simmer time. Stew meat is typically a tough cut of the meat, so the longer it simmers, the more tender and tastey the stew will be. Anytime I make stew, it simmers a minimum of 6 hours, but thats after I put it in the crockpot. Since this recipe calls for two hours of oven time after browning, thats probably why it called for a long simmer time before the oven. Thats a pretty unique idea. And very creative. Looks good! Looks fab. We always just made the stew or soup and put it in the raw cleaned pumpkin. This looks fun too. This is so festive looking. I will have to give it a try. 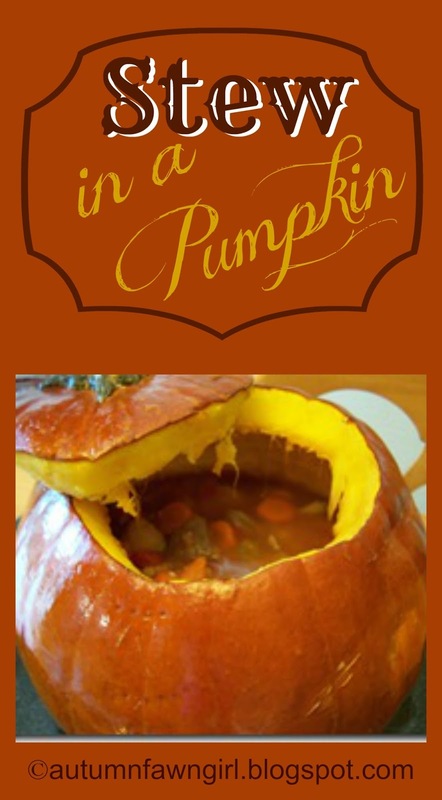 What a wonderful idea - it's the perfect fall dinner! Sounds delicious too! I love stew, and making and serving it in a pumpkin is a great idea for fall! This looks yummy and definitely perfect for fall. This is so cool! I want to try it for my small group! YUMMY! This sounds fantastic. Can't wait to try it. we are having a Sukkot Festival in a couple of weeks- I will be making this ; )!